BANGI, 19 Jan. 2012 – The founder of Waqaf An-Nur Corporation Berhad (WANCorp), Tan Sri Ali Hashim has suggested the Malays form a corporate endowment institution as a ase to assist them to succeed in business. 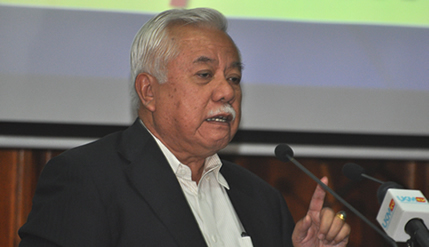 The former President and Chief Executive Officer of Johor Corporation (JCorp) said the corporate endowment institution can be the business strategy and formula with the potential to enhance the the Muslims’ economic standing. Ali Hashim was gaving a talk in the National Univeristy of Malaysia (UKM) Leadership Talk Series on “Leadership in Enterepreneurial Development”, here today. He said Islamic values like trustworshiness needed to be integrated in business. He also urged the Malays to be involved in business which is an important economic activity referring to Prophet Mohamad’s sayings that 90% of human livelihood emanates from business activities. Success in business should be for the benefit of the ummah. Business should be part of the Malay culture while culture be also developed for business. A corporate entity be set up on the lines of a multinational corporation and the Government Link Corporations. The Malays, he said should be encouraged to be involved in business and not be afraid to become rich. But it should be without the trappings of the wayward life styles of some businessmen. On the concept of corporate endowment, Ali Hashim said JCorp gave 75% of the shares of one of its subsidiaries which handles the haj and umrah, worth RM260,568 to WANCorp in 2005. This was followed by placing shares worth RM200 million from another three of its subsidiaries, Kulim, KFC-Pizza Hut and Johor Land Bhd in 2006. “The recognition and legitimacy given opened the way for WANCorp to enhance its growth to become one of the first corporate endowment institutions in Malaysia. “The combination of being a corporate endowment and a corporation makes us confident WANCorp can become the main body to help strengthen the economy of the Malays and Muslims here,” he said. He said the structural concept of the trustees managing the endowment must conform fully with the basic requirements of endowment as set by Islam. “It must be structured to ensure business dealings can be done smoothly so that corporate moves to expand business through acquisitions and joint ventures can be done without hindrance. “This will enable the company to increase its asset value and guarantee the survival of the business entity in increasing wealth for the long term,” he said. He mentioned how WANCorp succeeded in helping the poor to start businesses and helpling single mothers through its Capital Assistance Business Fund Programme. It also helps businessmen to expand their businesses. Ali Hashim moans the excesses of businessmen who because of greed had become immoral to the extent that corporate men had carried the stigma of being interested only in amassing wealth even at the expense of others. Such excesses should be taboo. He gave the example of Bernard Madoff, 75 who was jailed for more than 100 years for siphoning funds from the rich with dubious investment schemes in America. Ali Hashim who is also the Deputy President of the Malaysian Islamic Chamber of Commerce quoted from former owner of The Body Shop, Anita Roddick, who described the listing of her company “as a pact with the devil” since she had likened the stock market to a casino.